The bike path is called amber path and the whole itinerary leads from Krakow, through Brno to Wien. The part chosen for you is from Brno to Novy Prerov. You will go through the southern part of Moravian region full of beautiful nature and historical monuments. 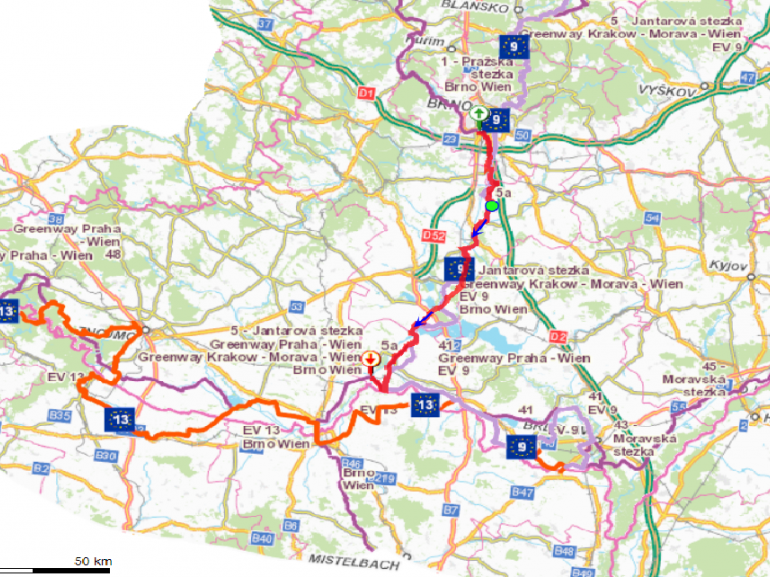 Why we love it: The itinerary takes care of cyclists- there are 15 official cycle boards with a map and little bit of history and the markings during the itinerary are also very good. Our Advice: We do not recommend this itinerary in tropical days, as there is lack of accompanying forests or greenery. We will start in Brno. Brno is the second largest city in Czechia. It has both- modern and historical site. It is charming city, full of young energy. You will find many students here and the city is adapted to their needs- a lot of social activities, talks, great restaurants and many more. 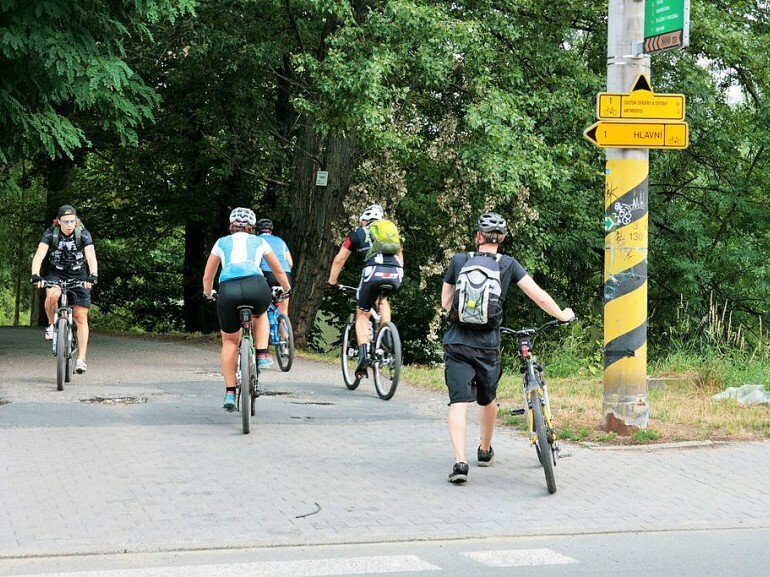 If you decide to visit Brno, take your bike with you and follow this itinerary. You will experience much more from the Moravian region than driving through it by car. To leave the city, you can follow the bike path along the river Svratky. It is quite frequented path- full of in-liners and cyclists. Passing the Avion Shopping Centre, you will see the zero kilometre of bike path Brno-Wien. You will soon get to the cycle-crossroad above the confluence of the Svratka and Svitavy rivers. From here on, you will follow the bike path number 4. When you will come to the road from Modrice to south-end of Olympia areal, the crossing through the road might look complicated. But thanks to clear signs, you will easily handle it. Following the path, you will get to Rebešovice, where the only ascend of this itinerary waits for you. Descending will end in the village called Rajhradice. Behind Opatovice, at the foot of the Výhon hill, we are changing the road for cycle path again. Everything is nicely marked, so you will just follow the markers. You will go along the river Litava to Židlochovice. Here, you can see the summer presidential residence and the present-day government conference space. It is unfortunately inaccessible to public. Continue to follow the itinerary and you will soon get to the forest greenery of Plačkův les. Biking along the river Jihlava, you will get to quite dangerous crossing between your cycle path and the road R52 Brno- Mikulov. You have to be really careful here. After crossing the road, Pasohlavky- quite touristy place- is waiting for you. This recreational zone offers everything you need, so if you are tired, just stop by and gain some strength. From the main road, you will turn left to the camp Merkur with natural pools. Take some rest or continue the itinerary. After crossing the bridge over Horní Novomlýnská nádrž, you are entering a wine region of south Moravia. Wine educational trail Stara Hora will take you to our last and ending village Novy Prerov, which is bordering Austria. To come back, you can either follow the same itinerary or go by train. The nearest train station is in Jevišovka, where you can get by following the cycle path “signalka”.